McLaren's MP4-12C sports car is in the final stages of development and is expected to be lighter, greener, more efficient and more powerful than rivals from Ferrari and Mercedes. The British-built supercar will hit the UK showrooms in early next year at a price of around £175,000 - just over the £169,545 asking price for a Ferrari 458 Italia and a lot more than the £145,000 you need to get your hands on a Mercedes-Benz SLS AMG. Full-scale production at the McLaren Production Centre will start in early 2011 and cars will be sold at 35 dealers worldwide. McLaren has already received 1600 enquiries from potential buyers and the car will be available to order in two to three months' time. 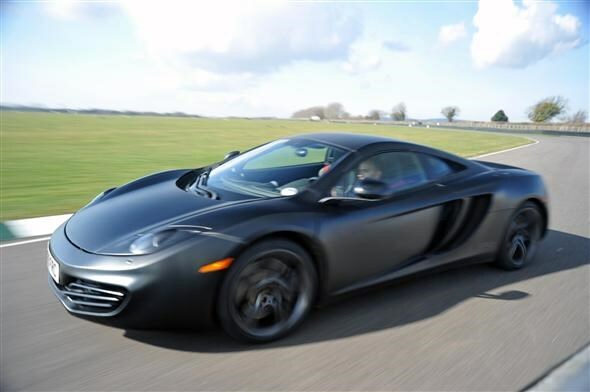 The MP4-12C uses a carbon composite monocoque and lightweight materials to keep weight down. It's powered by a twin-turbocharged, 3.8-litre V8 engine producing 592bhp at 7000rpm. Peak torque of 599Nm is available from 3000rpm, although 80% of that is available between 2000-6500rpm. It should be suitably brisk: the 0-60mph sprint is expected to be under 4 seconds and top speed will be over the 200mph mark. McLaren hasn't published a figure for fuel economy yet but says its CO2 emissions will be less than 300g/km, which is 'class leading' and expects fuel economy to be the same. It uses a twin-clutch seven-speed gearbox and a F1-style paddle-shift that uses a single aluminium rocker bar directly behind the steering wheel. There are three driving modes - normal, sport and track - and they adjust the steering weight, stability control, suspension and roll stiffness. A separate setting for the powertrain adjusts the throttle and gearchange response as well as engine acoustics. It won't be a stripped-down racer though: standard interior features include a seven-inch touch screen and Wi-Fi.